Why should my son / daughter attend a cccSkerries camp? Fun. Creativity. Being engaged. Learning new skills. Making new friends. Making projects and showing them to parents & siblings on the last day. Doing something new with technology – or going deeper, if they already have experience. These are some of the things that past participants have mentioned when asked what they liked about the cccSkerries camps. How many will be in the camp? Small group size (meaning individual attention!) is one of the things that are special about cccSkerries Camps. The minimum number is 4, though most camps have 5 or 6 participants. We are based in Kelly’s Bay, Skerries, Co. Dublin. The training room has a large table with space for six laptops, and a sofa area where participants can learn as a group, with a large screen. I call it “the knowledge bagging area” 🙂 This image shows the table during a Minecraft session. The room has a dedicated bathroom. Are the camps for all ages? Are the ages to be taken very strictly? There are camps for a wide range of ages, starting with those who are going into 1st Class, up to secondary school. Most camps are offered for a range of ages, like “2nd to 4th class” – exceptions are possible. Please contact Sabine (Sabine@cccSkerries.com) in this case. Should campers have laptops? Experience? We have enough laptops for everyone, and there is no need to bring laptops. Please contact Sabine (Sabine@cccSkerries.com) if you are in any doubt. Is it a good idea to spend some of the summer indoors? The camps are 3 hours per day – ample opportunity to enjoy the summer (fingers crossed we’ll have good weather!) before or after camp. Why are the camps only four days long? Some weeks have Bank Holidays, and experience has shown that it’s not a good idea to run camps – another thing I learnt is that on Fridays of other weeks, many leave for holidays or long weekends away. Given that the groups are very small, and that it makes a big difference if only 4 out of 6 are present, I decided to offer four-day camps this year. A snack for break and something to drink. Water works best. That’s all! When is the fee due? What payments do you accept? Fees are due on the first day of camp. Payments can be made by bank transfer (this works best and is quite fast once set up on your side) or with credit / debit card after the first day. I do not accept cash or cheques (on the advice of my accountant – it’s best to have an “electronic trail” of payments). I am Sabine McKenna, a qualified primary teacher (HDip Primary Education, Hibernia College 2010; full teaching diploma, member of the Irish Teaching Council). 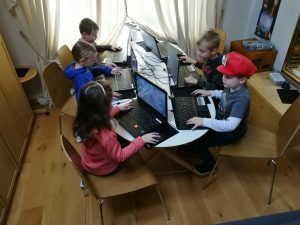 I’ve been teaching computer camps and after-school computer classes in Skerries, and am running various computer workshops in libraries in the larger Dublin area, since the summer of 2013. My love for computers goes back to a year spent as a visiting student (I am German) in St Patrick’s College, Maynooth, Co. Kildare, in 1986/87, where the English Department insisted that one essay be submitted “word-processed.” They were ahead of their times! I was hooked… and have been learning and teaching all things digital ever since. This includes post-graduate diplomas with the Open University (Computing for Commerce and Industry, 2005), the University of Limerick (Digital Media Development for Education, 2012) and the Digital Marketing Institute (2014). At the moment, I’m deepening my Python and 3D graphics / Autodesk Fusion 360 skills with Udemy. I love learning!